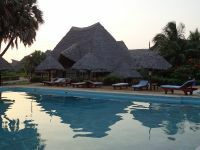 Situated in the beautiful coastal town of Malindi in Kenya, only a few hundred meters from the magnificent beach, lies The African Pearl Hotel, a warm and cosy hotel. It is 10 minutes walk from the beach and has friendly staff to make your stay more comfortable, nothing is too much for them. 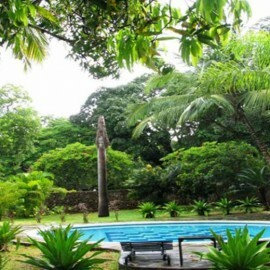 African Pearl Hotel provides accommodation in singles, double rooms , family rooms and self catering cottages. The rooms are modernly furnished to ooze style and comfort. The self catering cottages have beautifully decorated lounge and a fully fitted kitchenette with stove and oven, fridge, crockery and cutlery. They have a small, charming hotel set in lush gardens, full of friendliness and smiles, for family relaxation, culture and sightseeing, relaxation, swimming and outdoor activities. Guests, many of them regulars, meet at the bar or around the stunning pool area, where day becomes night while you sip a drink and listen to some good music.